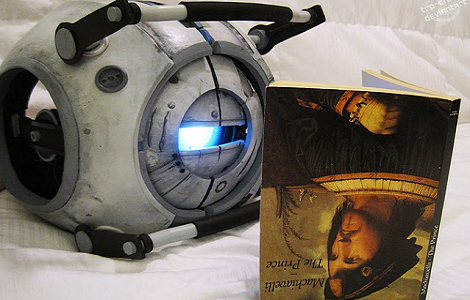 Did not play Portal 2, but the first one was awesome. That said, the finish quality on this puppet build is fantastic. The texture and small details are hard to believe considering the medium used to create it. This would be about 100x harder to make with fiberglass or vacuum plastic. Nice work keeping it simple and still making a great end product. Nifty. I want to get P2, but there are other things I’d rather spend the money on for the moment, I’ll wait until the price comes down. Just FYI, Steam dropped the price to $29 last week. Wow! Amazing quality and detail. Great articulation. I agree with spork on the medium of choice. Applause! Very, very well done! I love the article picture… Perfect. Shocking bit of craftsmanship there. The only thing that gave it away as not a cg shot was the book was too detailed. Dude! you are a god! who can ignore such an opinionated thing.